Millennium Broadway New York Times Square is located in the heart of NYC, giving guests a front row seat to all of the endless action and constant excitement of Broadway. Catering to both leisure and business travelers is why Millennium Broadway a perennial favorite among travelers to NYC. Amenities include a multi-lingual cast and crew, 626 well-appointed rooms, a 24/7 fitness center and complimentary Wi-Fi. Meeting and event facilities are second to none. Dine at the Restaurant Charlotte. ABOUT TENNIS TICKETS AND MATCHES. These packages are based on Upper Promenade seating at Arthur Ashe Stadium for all matches. 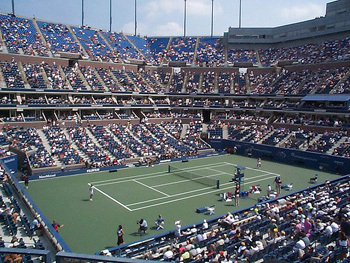 There are two other stadiums and many "outer courts" at the United States Tennis Stadium venue, but Arthur Ashe is where most of the premier matches are held in the early and middle rounds, and it is the site for all Championship Weekend sessions.